I was debating what I wanted to post next on, now that I'm back to everyday blogging, when Mr. BTEG presented me with a couple of doll items that he made for me with his 3D printer. That made me happy, and my choice of post easy. But I'm going to start at the beginning of my experience with 3D printing for dolls, for those of you who haven't been reading me for years, or don't recall previous posts. In January of 2016, I tagged along with Mr. BTEG at a technical conference he was attending. The conference happened to conveniently be held at a large indoor waterpark, which especially in a NE Ohio winter, is very appealing. Mr. BTEG had already started exploring his interest in 3D printing, and he pointed me to a website called Thingiverse, where I discovered that the late lamented Makies Lab had put up several free downloads for prints, including a tea set. The conference offered free 3D prints, so Mr. BTEG had them make the tea set for me. As you'll see, the set is very primitive compared to some of the other things that I'm going to show you, but just being able to have something printed for your doll like that *snaps* was still very exciting. 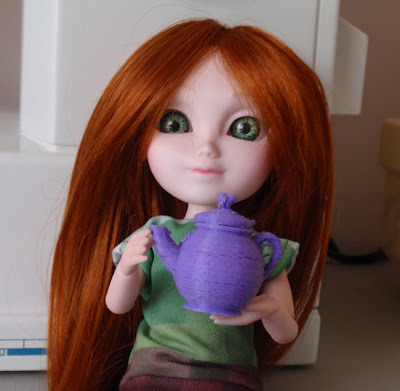 Here's Meg, my only Makie, holding the tea pot from that set. Then Mr. BTEG invested in a lower-end 3D printer of his own in January 2018! I had no idea how hard it was to set up a 3D printer to make a suitable print. It can take hours to make sure the printer lays down filament correctly, so that the filament doesn't get shifted, and throw the whole print out of whack. Here's a couple of examples of common prints made to test your 3D printer. The above are blocks printed out to test the X, Y and Z axis of a print. The background is one of my Barbie diorama walls, so you can see that the blocks are fairly small. I hope you can also see the "shadow" of the Y on the middle block, which meant the Y axis needed some work on that particular print. The piece above is called a "benchy," and is also apparently known as "The jolly 3D printing torture-test." Obviously, you don't print this out until you're a bit more confident in how your printer is configured. You can visit 3DBenchy.com to check out all the creative things people do with benchy prints. It's also the source for my quote above. Come see what else he made below the fold! During the time he was most actively printing, besides printing out a bunch of blocks and benchys and other small things, he did make a few doll things for me. One was a small white teacup, made from the same Makies Lab pattern my original tea set was made from. That cup is also a little crude; it was made fairly early on, while he was doing some more testing. The next thing that he made me is a playscale sized sword. Dexter Charming from Ever After High is modeling with it. Only one side has the raised detail that you see. The other side is completely flat. It's a cute piece, though. For several months last year, Mr. BTEG was not in the 3D printing mood. Very recently, he found the motivation to start printing again, improved his printer, and started printing out pieces for the new printer set-up. Here's the printer, some of the pieces he's printed, and he even has a camera to keep an eye on his print if he's not at home. To a degree, he can control the printer remotely. Here's the filament he's currently using, along with some blocks, benchys and a vase he printed previously. The edges are a bit rough in some places, but the one of the great things about these items is that they can be sanded and even painted, so I don't have to stick with a bright orange table. The table is as long as Mr. BTEG can print right now, but he could make the table taller, which would make one a better size for Barbie, and not 8" Stacie. It's a much improved teapot print, and I think it's also a little bit bigger. Here's the teapot and cup my husband made for me, across from the teapot and a cup made in 2016. Keep in mind that just the orange teapot above took about an hour to print. And here's the entire tea set design from Makies Lab, including a two-handled sugar bowl with lid, and a small creamer. I'm looking forward to getting an entire new-and-improved tea set at some point. I wouldn't mind one of those 3D printers myself Barb, 'cept I had heard you need a lot of patience to set things up...and I have very little of that. LOL! I bet you're full of ideas for hubby to practice on. Wow, that is interesting. It's so "Star Trek." I can't wait to see the other items. It is pretty amazing, isn't it? I'll be sure to post when Mr. BTEG finds time in his printing schedule to make something else for me. Oh, the Makies. I never got one!!! Those are some cute items your doll's have, especially that table! I'm glad I have a Makie, but am sorry the company never got resurrected in any reasonable way, as I would have liked more. There are patterns to make printed dolls on Thingiverse, but none are as sophisticated as the Makies were. Isn't it cool to just be able to create a plastic piece of doll furniture like that? I forgot to mention in my post that there is also filament to make your items look like wood when printed, although it's apparently even more finicky to print than the regular kind. Oh! 3D printing is one of those things I dream about being able to do! I'm quite jealous! So many possibilities! I get very excited when I think what the capabilities of 3d printers will be in ten or twenty years! There are a lot of possibilities, for sure! I hope that in ten or twenty years, 3D printers will be smaller, easier to use and more affordable, kind of like computers have evolved. I'm really interested in 3D printing. Some years ago, I installed and tried to use a 3d modelling software, but I went back to college and didn't get to learn how to properly use it. I was interested in printing stands for my Monster High dolls, and I even found an archive with all the pieces for it. If I ever try to learn 3d modelling, I would try to make doll dinerware, as well as some furniture. I love the table, it looks really cute. If it's too small to be a dining room table for your 12' dolls, try to use it as a coffee table. My grandma had a similar one in off White with Golden accents. I really hope to see more 3D print stuff in the future. 3D modelling software sounds challenging! I'm pretty sure there is at least one version of a Monster High stand on Thingiverse, as well as some other items for their size. Have you checked to see if your college or largest library near you offer 3D printing services? The table could definitely make a good coffee table, or I could use it with any of my 8"-10" crew. Right now I'm thinking about painting it pale blue with cream accents. I take distance lessons at college, so the actual building is quite far from my hometown. However, I may check my local library, as they're moving to a bigger location and they may add new services. I'm fascinated by the way 3D printing is becoming more and more mainstream so I love that you're getting to experiment with that. Yep, there is all kinds of new potential opening up with 3D printing becoming more and more accessible. It seems to be the next big revolutionary invention. Wow it looks great and makes so many possibilities! I love this table. I agree; there are so many things that can be made with this. I love the table too. I will show it again here after it is painted. Oh that is awesome! I love 3D printed stuff. I am sad that Makies are gone. They got bought by Disney and are apparently used to make Avatar dolls with your face at Disneyworld. I'm very disappointed that the Makies are gone. It was a good idea, with a poor business plan. I remember there was a lot of optimism when Disney bought the Makies, but I'm honestly not surprised how relatively little Disney has done with them. Please contact me to let me know if you received the Basic Fun list I sent you. Tam from Planet Of The Dolls was also interested, so I need to know where things stand. Thank you and I hope to hear from you soon. So many lovely props!! I love the things you did!! Twelve Days of Christmas - Day Eight: Zzzzzzzzz!